The future of work is evolving into a more technological, collaborative place where problem-solving and creativity drive results. New Hampshire Destination Imagination is dedicated to sharing programs that help students growth their creativity, collaboration and problem solving skills in a way that leverages what they learn in school – and have fun doing it! Annually, we offer seven new standards-based Challenges in STEM (truly STEAM), Improv, Visual Arts, Service Learning, and Early Learning. Each Challenge is open-ended and enables student teams to learn and experience the creative process from imagination to innovation. Academic tournaments take place around the world where teams have the opportunity to present their solutions to trained Appraisers. Students have fun and gain confidence in their ability to solve any challenge. [Click for the summary of this year’s Challenges]. 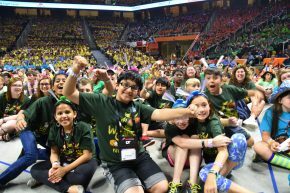 Last year, over 1,800 students from around the New Hampshire schools and community groups took part in our competitions, with 36 teams advancing to compete with teams from the United States and the world at Destination Imagination Global Finals. New Hampshire has over 110,000 alumni (people who have done “D.I.” as when they were students), and are part of the 1.5 million global alumni. Many alumni return to help the program in the Granite State and around the world! Still have questions? Click for details on how to contact us! Team registration will start soon!